Some superintendents have a pat answer when asked to assess the quality of their schools – they’re all equally good, they might respond. But Gary Yee, the new acting superintendent of Oakland Unified School District, had a different answer when parent Maria Zaragoza asked why her child’s high school does not have any of the innovative educational programs available at some of the district’s top-performing high schools. That was, after all, why Yee and about 100 parents, teachers, school administrators, students and city leaders, including Oakland Mayor Jean Quan, had gathered on a chilly Wednesday morning last week on the soccer field at Life Academy of Health and Bioscience, a high school in East Oakland. A few minutes earlier, the superintendent had told the group that his goal is to get 80 percent of Oakland’s high school students in grades 10, 11 and 12 into what are known as linked learning academies, programs that integrate academics with internships and job shadowing to provide real-world work experiences for students. At Life Academy, students intern in hospitals, medical offices, retirement homes and elementary school programs for at-risk children. Oakland Unified has 29 academies in 11 of its 17 comprehensive, alternative and continuation high schools. Together, the academies serve about 2,800 students, or 42 percent of the district’s 10th through 12th grade students. 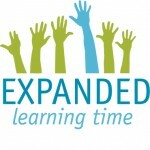 The number was slightly lower two years ago, when the district received a $2.7 million, four-year grant from ConnectEd, a Berkeley-based nonprofit, dedicated to expanding linked learning, and agreed to double that number. The district has until 2016 to boost participation by 2,270 students. 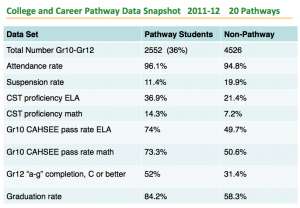 Oakland is actually better positioned than most districts to make this transformation. Four years ago, former superintendent Tony Smith, who left the district in June, launched a community schools movement to focus resources on each student by engaging health, community and social services agencies in supporting children and their families. Linked learning, which requires business and industry participation and provides individual support to students, is part of that movement. “It’s really a universal high school transformation,” Yee said. But getting to 80 percent presents hurdles that cross all sectors of education: money, time, teacher preparation, staffing, curriculum and class scheduling. The district has to start new programs, expand existing academies and sell students on some that are under-enrolled in some of the larger, comprehensive high schools. The district is focusing this year on increasing the number of academies at three schools in the city’s poorest neighborhoods. One of them, Castlemont High School, which currently has a sustainable urban design academy, is close to starting a second program either in public health or manufacturing and engineering. Last spring, McClymonds High created a Science, Technology, Engineering and Math center, known as STEM, and Livesey said the plan is to eventually have every student at the school in an academy. That’s the structure at Fremont High, where students attend one of three academies – in media, engineering and architecture, or law and public service – housed at the campus. Academies cost more to operate than traditional schools. 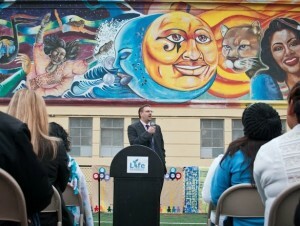 Oakland officials do not have current financial information on what the expansion would cost, but the State Department of Education, which funds nearly 450 programs through the California Partnership Academy program that supports career tech programs, provides up to $81,000 a year to each academy depending on the grade level and success of their students. To finance the new academies, Oakland Unified plans to apply to the Career Pathways Trust, a $250 million fund for linked learning programs created by a new state law, Senate Bill 594, Livesey said. The state’s new school funding law, the Local Control Funding Formula, will also open up additional money that could be spent on academies, Yee said. The idea behind linked learning is to make education relevant and engaging for students by integrating rigorous academics with real-world experience through internships in local business and industry and job shadowing. Academies focus on a theme, such as health, law, science, engineering or green energy. Students at Life Academy, often highlighted as a model linked learning campus, select a career pathway in medicine, mental health or biotechnology and get internships where they work with professionals in labs at local hospitals, the Chabot Space and Science Center or public health advocacy organizations. Life Academy principal Preston Thomas said linked learning “puts the why in schoolwork,” by making the connection between what students learn in class and the careers made possible by their education. For many of Oakland’s low-income, Latino and African American students, academies expose them, often for the first time, to the idea that they have opportunities beyond what they see in their neighborhoods and at home. Through the school’s linked learning program, Beltrán interned at Alta Bates Medical Center in Berkeley. She also had a mentor who had been to college and could guide her in a way her parents could not. Beltrán graduated from UC Berkeley in May with a degree in English literature and plans to become a high school teacher. She currently works in Life Academy’s after-school program helping students who are struggling in class. The Oakland-based research and advocacy organization Ed Trust-West conducted a two-year study of linked learning programs in four California high schools and found that students in these programs had greater access to the coursework that’s required for admission to the University of California and California State University — called A-G courses — and were more likely to graduate than similar students at non-linked learning high schools. African American, Latino and low-income students in linked learning programs had graduation rates 9 to 29 percentage points higher than the statewide average. 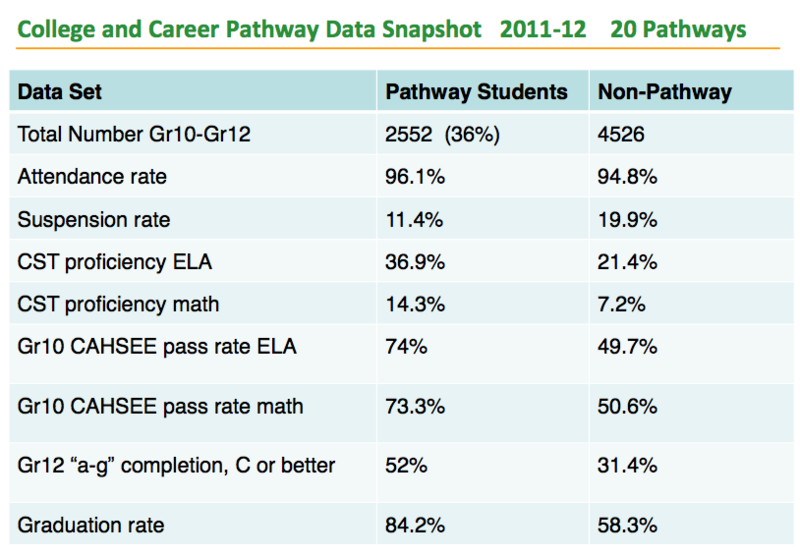 Oakland Unified conducted its own analysis of district programs and found that academy students had fewer absences, experienced lower suspension rates, scored better on standardized tests and were more likely to pass the high school exit exam. 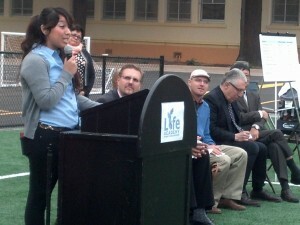 Last week, on the Life Academy soccer field, the district announced a partnership with the city of Oakland and Peralta Community College District to create pathways from high school to college to career. Although Oakland Unified requires all graduates to complete the A-G curriculum, a majority of Oakland students enroll in community college after high school, rather than enrolling in four-year universities. But there’s not much alignment or even conversation between the two systems, said Laurie Scolari, who oversees the California Community College Linked Learning Initiative at Career Ladders Project, a nonprofit in Oakland. A key part of the new collaboration is a data sharing agreement that will make it possible to follow every high school graduate in Oakland to see what happens when they get to community college. That will give a clear picture of whether high schools are doing a good job of preparing students for college-level work and where the gaps are between academy and community college programs. Scolari said her project is developing similar partnerships in eight regions across the state. Fifty years ago, when Superintendent Yee was a student at Oakland’s Castlemont High School, he said the goal of his classmates was to graduate and get a job. Today, it’s to graduate and go to college. But just getting into college isn’t enough, Yee said. Having students succeed in college will be a sign that Oakland’s high schools are a success, he said. Kathryn Baron is a senior reporter at EdSource Today. Contact her or follow her @TchersPet. Sign up here for a no-cost online subscription to EdSource Today for reports from the largest education reporting team in California.